Best Book title: The Stains of Love…Sometimes Too Much Love Hurts. Best Foods: malakwang, boo, chicken in sauce, matoke, beef in g-nut sauce. Most Euphoric Moment: Uganda’s third goal against Angola in world cup qualifying match. Least Euphoric Moment: Pocket picked at same match. Best Sign: See above. At same number you can also get “Brain Booster” “Hips Gain ” “Bum Gain” and other benefits, all with no side effects. Next What is the What? During my Rotary trip in Kampala, my favorite radio commercial was “Get off the sexual network, stay faithful to one partner”. I also enjoyed eating fried crickets! I have just read your articles , i am born and living in Uganda. my email is tibagekafrank@yahoo.com. I am seeking to build friendship with you if you can allow it. visit my website and learn more about us. Thanks for the note, Diana! Glad to hear the story brought back good memories for you. It certainly is a great part of the world. Bum enlargement included. I never did have a rolex, but it sounds rich. I’ll have to try it next time. So in a very random turn of events, I read the article you wrote for World Ark today while substitute teaching in a 7th grade class. I spent two months of my summer in Uganda (mostly in Gulu) working for an NGO and reading your article brought back such happy memories of wild boda boda rides, long waits in the bus park, and a very special Obsessions concert. 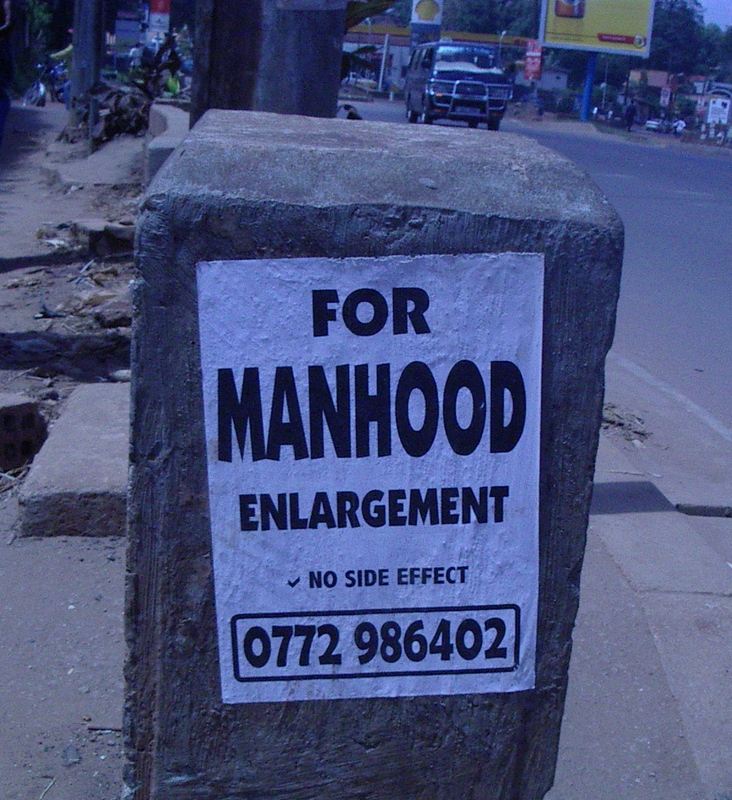 Further, I absolutely love this post, especially the “For Manhood Enlargement” signs. I never got a picture of them but they brought me such joy as I walked the streets of Kampala. Did you never have chapatti or a rolex? I am rather surprised not to see them on the delicious foods list.